Daydreaming upon a bed of cushions, I open my eyes. Rain is falling on the glass ceiling and walls as I watch as a group or goats wander over the neighbouring hill, oblivious to the late October chill. It is there, warm and content in a post yoga-and-sauna daze, that I release just how glorious Austria is - regardless of the season. 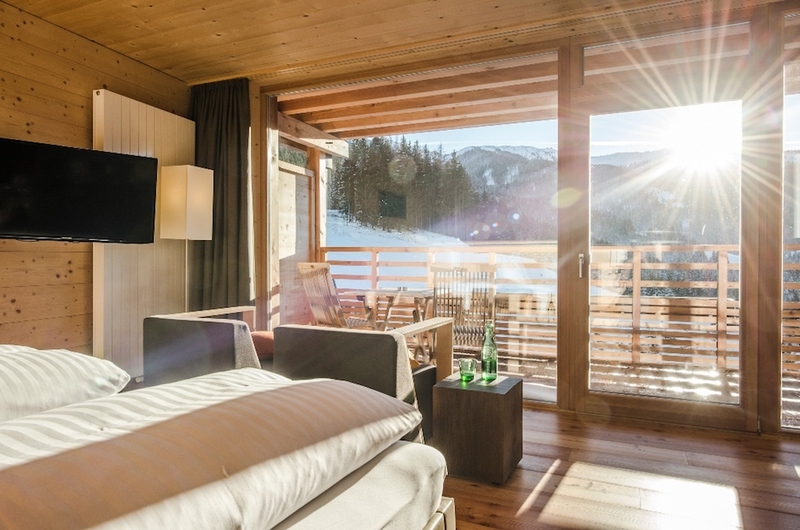 Whether you venture to the mountains beyond Salzburg to ski, cycle (this hotel is found by one of Europe's biggest mountain bike trails) or hike, you'll surely be swept up in the Forsthofalm magic (and the setting of course). While it may be found near the town of Leogang, Forsthofalm feels very much like it's in the middle of nowhere; beyond these walls there is nothing but forest and mountains that make the idea of returning for a winter jaunt remarkably tempting - ski-in ski-out doesn't get much more convenient/scenic than this. With only 54 rooms spread across seven floors, this in a sports hotel (there is no need to leave the premises for anything other than an adrenaline hit) with a difference. It is family run, offers the finest and heartiest fare and has an eco-friendly heart. I'd journeyed here to try my hand at the Forsthofalm Mountain Life Programme - a series of indoor and outdoor exercise sessions ranging from early morning yoga (the ideal way to wake up) to rather intense pilates classes (good intense, don't worry), hikes, weights-based workouts and evening saunas (to name just a few of their offerings). Even as one without a particularly effective core or a sizeable amount of motivation I found myself hooked; the combination of endorphins, expert teaching and sense of fun making the entire experience all the more enticing. And of course, when you work out you become totally deserving of a spa treatment - and on this front Forsthofalm once again delivers. After winding down in a series of scented saunas, it's time for a massage, which is catered to one of the five moods you may find yourself in. The oils and scents used are created on site from wild herbs collected in the garden and forest for a little added bliss. 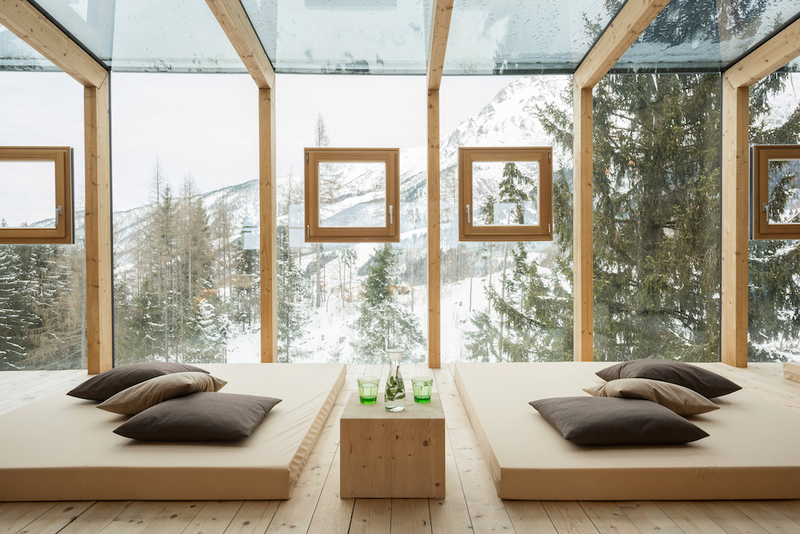 Should you be able to pick your suite I'd recommend asking for the 'Secret Forest', which comes complete with suspended wooden bed, fireplace, private sauna and panoramic view of the mountains. That said, each sizeable, beautifully designed room, boasts plenty of charm. The hotel is built almost entirely from wood. The walls are spruce, as are the nails, the sculpture-like furniture is larch and bed is made from pine. Situated as it is in the middle of nature, it made sense to construct the building from natural materials - an added incentive for those in awe of the wild to travel up the mountain. 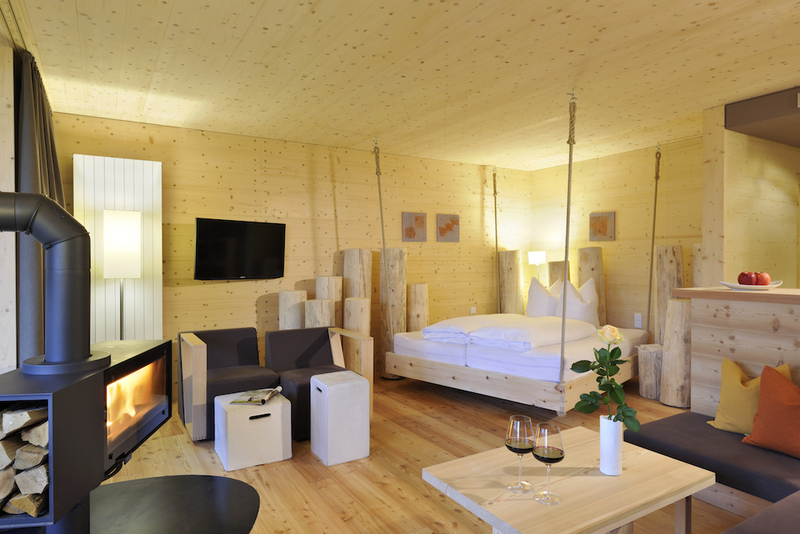 These rooms are also designed to grow more more beautiful with age - the patina of time adding to Forsthofalm's warmth. Here it really is all about seasonality. In summer you'll find a rooftop bar by the outdoor pool serving a mix of cocktails and ice cream (the ideal post-sauna/work out cool down) and during October I sipped autumnal cocktails by the roaring fire of the bar. The restaurant menu also shifts throughout the year. Food is at the heart of hotel - indeed, it began as a place for skiers to enjoy winter lunches back in 1972. Enhancing their hearty meals (the menu changes every night and the ingredients used are largely organic and sourced from local farmers) is a collection of 300 wines - 50 of which are natural, a relatively new trend in Austria. After dinner there are a string of events on offer, from live music to cocktail tastings, all designed to bring people together and help foster the sense of community the hotel prides itself on. That said, don't underestimate the deliciousness of returning to your cloud-like bread and drifting off with a good book, no doubt dreaming of your return journey - which, let's face it, is inevitable. You can learn more about the hotel and make a booking here.